Oppo A83 Price in Bangladesh is 13500 Taka. Oppo A83 comes with 5.7 inches IPS TFT Display with 720 x 1440 pixels screen resolution. It has 13 MP camera on the back and 8-megapixel front camera for selfies, featuring with Aperture Rear & Front: f/2.2, face unlocking, Geo-tagging, touch focus, face detection, HDR, panorama. Oppo A83 powered by 2 GB of RAM and Octa-core 2.5 GHz processor. It comes with 16 GB internal storage which upgradeable up to 256 GB by a standard MicroSD card. This dual-SIM phone supports two nano sim. The smartphone has a Non-Removable 3180 mAh Li-ion battery. Oppo A83 powered by ColorOS 3.2. based on Android 7.1 and no java supported. The dimension of the phone is 150.5 x 73.1 x 7.7 mm and gross weight is 143 grams. This smartphone comes in two color Champagne and Black. Gnolass, E-Compass, Light Sensor, Proximity Sensor, Accelerator Sensor available on this smartphone. Hope you are satisfied with our Oppo A83 Price BD, specifications, offers & reviews. 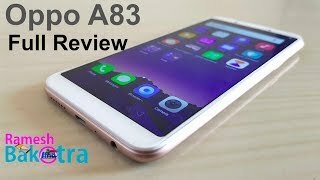 If you are one of the user of Oppo A83 please don’t forget to drop a review by the above reviews tab. It is very important to us to know the performance of the smartphone.